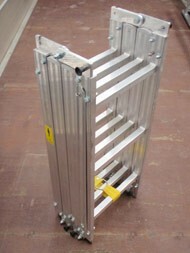 Folding & Telescopic, Fire Service ladders. Available in a variety of designs and formats. Individual leg adjustment for steps on slops or stairs. 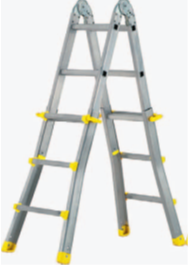 Streight ladder extends telescopicaly into various heights. Splits into 3 individual working sections. Splits to create 2 trestles. Easy Stow Folding ladder, 4 piece.